Find artworks, auction results, sale prices and pictures of James Montgomery Flagg at auctions worldwide. 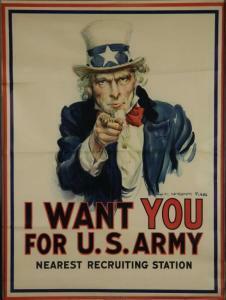 Sale 2498 Lot 350 JAMES MONTGOMERY FLAGG (1870-1960) I WANT YOU FOR U.S. ARMY. 1917. 40 1/2x29 3/4 inches, 103x75 1/2 cm. Leslie-Judge Co., New York. Condition B+ / B: extensive overpainting and partially-replaced margins; repaired tears, creases and restoration in margins and image. Flagg p. 80 and cover, American Style 60, IWM p. 27, Rawls p. 13, Theofiles 11, Darracott 13, Rickards 14, Borkan p. 13, Word & Image p. 48, Modern American 24, Power of The Poster 156, War Posters 18, The Poster 123. Flagg, James Montgomery (American, 1870-1960). "I Want You." 1917. Offset lithograph poster. Leslie Judge, New York. Flagg p. 80 and cover, American 60, IWM p. 27, Rawls p. 13, Theofiles 11, Darracott 13, Word and Image p. 48, Johnson 24, Power 156. Sheet: 30" x 40" Framed: 40 3/4" x 31" Condition: Fold creases. Under glass, not examined out of frame. Sale 2495 Lot 62 JAMES MONTGOMERY FLAGG. Group of 3 story illustrations. Charcoal and graphite on board. Young couple seated. 458x368 mm; 18x14 1/2 inches. Signed in full * Young couple pleading with older man. 482x368 mm; 19x14 1/2 inches. 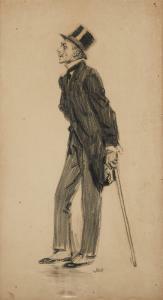 Signed in full * Man with cane and top hat. 557x318 mm; 22x12 1/2 inches. Initialed. Framed. Description: James Montgomery Flagg (American, 1877-1960) Gentleman in Partial Evening Dress Preparing to Shave. 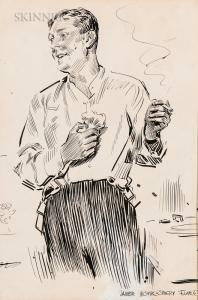 Signed "JAMES MONTGOMERY FLAGG" l.r. Ink and whiting on illustration board, sheet size 21 x 13 in., matted, unframed. Condition: Gentle toning, tape and adhesive residue around the edges of the front, staining to the reverse. JAMES MONTGOMERY FLAGG (1870-1960) WAKE UP, AMERICA! / CIVILIZATION CALLS. 1917. 40 3/4x27 inches, 103 1/2x68 1/2 cm. The Hegeman Print, New York. Condition B+: pin holes along top edge and in corners; water stains in bottom margin; minor creases and abrasions in image; slight darkening at edges; repaired tears in margins; slight flaking at bottom left corner; colors attenuated. Framed. America remained removed, both psychologically and physically, from the widening horror of the war in Europe through 1917. Yet, as distant and isolated as America was, the winds of war were not ignored by all. Before the United States officially entered the war, private groups of concerned citizens and businessmen took it upon themselves to begin preparing America for the upcoming conflict. 1915 saw the foundation of the Mayor's Committee on National Defense, in New York, which helped establish similar organizations across the country to raise awareness and retool American industry to handle the needs of a war. Here, in a potent allegory, Columbia is rendered peacefully sleeping and unaware on the front porch, while behind her, the flames and smoke of war can be seen in the distance. This poster epitomizes "the New World turnaround from innocent neutrality to all out war - the mechanism of mass conversion" (Rawls p. 9). Printed and distributed in New York City, this poster is substantially rarer than most other World War I images, which were printed in numbers intended for national distribution. 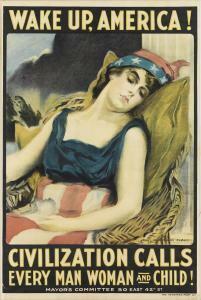 Given the care and attention Flagg paid to the design and printing of this image, he clearly had more time to work on it than his other Wake Up America Day poster, indicating that this poster would have been printed in the months following April 1917. Flagg p. 68, Rawls, cover and frontispiece, Theofiles 7.